The Martindale Thermokit is a comprehensive temperature kit, ideal for electricians, plumbers, boiler engineers and maintenance engineers. 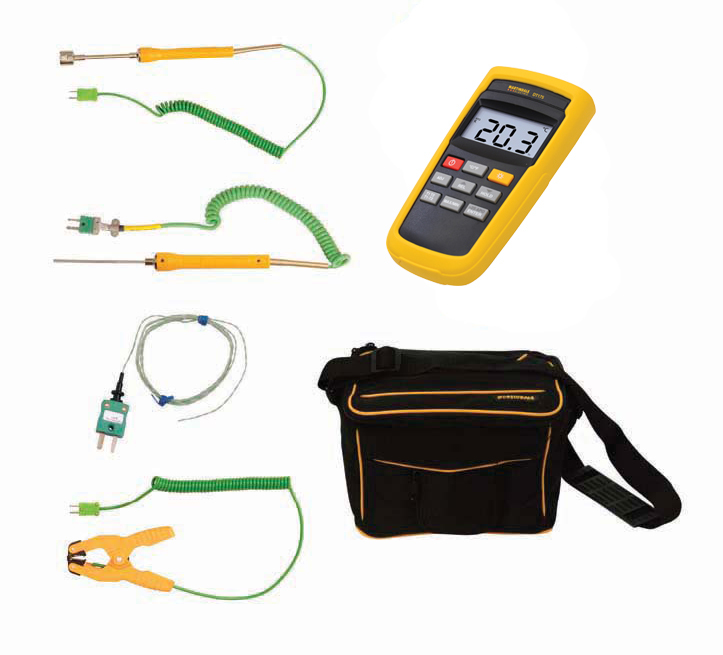 Supplied in a soft carry case, the kit includes the Martindale DT175 dual input thermometer, bead type probes, pipe clamp probes, an air probe and a surface probe. This is a high quality dual-input digital thermometer with temperature difference capability. It is able to measure input and output temperature and temperature differentials through boilers, radiators etc. and can accept a wide range of K type probe accessories. The meter comes with a protective rubberised holster and is switchable between °C and °F and between 1° and 0.1° resolution. Hold and min/max buttons allow the current value to be frozen or the maximum reading to be stored. The Thermokit comes complete with the DT175 thermometer, 2 x bead type probes, 2 x pipe clamp probes, 1 x air probe and 1 x surface probe.